Caption 1: The new Leeds Children's Mayor Charlotte Williams with The Vamps. 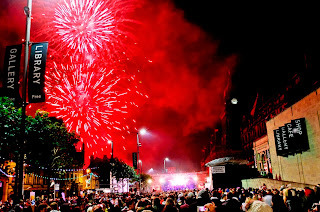 Caption 2: Fireworks light up the sky after the switch-on. It was another night to remember in Leeds, as the city centre’s Christmas lights were switched-on in style. On hand to entertain the large crowd were up and coming boy band Rubylux, Australian singer Gabriella Cilmi, The Vamps, Same Difference and the winner of Leeds City Council’s annual Breeze Has Talent competition, Kirsty White. A range of sporting stars also made an appearance, including Leeds United Manager Brian McDermott who was joined by Captain Rudy Austin and teammate Jason Pearce, the Leeds Rhinos and boxing Olympic gold medallist Nicola Adams. Santa Claus was also present on stage to wish everyone a Merry Christmas. Also present was the Lord Mayor of Leeds Councillor Thomas Murray, and the new Children’s Mayor, Charlotte Williams. Enjoying their first time at the switch-on event and second time in the city were The Vamps, who said they were really looking forward to playing in front of such a big, excitable crowd. Brother and sister singing duo Sean and Sarah Smith of Same Difference fame also gave fans a taster of what they can expect from their upcoming appearance in the Leeds Carriageworks Theatre pantomime production of ‘Sleeping Beauty’, with a fun-filled performance. "The Christmas lights switch-on was a brilliant event, and it was fantastic to see so many people attend on the night and enjoy the wide range of entertainment on offer. "This is always a great way to kick-off the festive season, and with a number of events also being held right across the city centre as part of our Winter WonderLeeds’ programme, this promises to be a very special Christmas."